We’d love your help. Let us know what’s wrong with this preview of The Reckoning at Gossamer Pond by Jaime Jo Wright. For over a century, the town of Gossamer Grove has thrived on its charm and midwestern values, but Annalise Forsythe knows painful secrets, including her own, hover just beneath the pleasant faade. When a man is found dead in his run-down trailer home, Annalise inherits the trailer, along with the pictures, vintage obituaries, and old revival posters covering its walls. As For over a century, the town of Gossamer Grove has thrived on its charm and midwestern values, but Annalise Forsythe knows painful secrets, including her own, hover just beneath the pleasant faade. When a man is found dead in his run-down trailer home, Annalise inherits the trailer, along with the pictures, vintage obituaries, and old revival posters covering its walls. As she sorts through the collection, she's wholly unprepared for the ramifications of the dark and deadly secrets she'll uncover. To ask other readers questions about The Reckoning at Gossamer Pond, please sign up. Jaime Jo Wright did it again! I loved this one just as much as I did her debut, "The House at Foster Hill." Of course it doesn't hurt that the cover is so dreamy and perfect, but the story inside is the real winner. Gripping and mysterious and making me hang on with my fingernails and feel great fear for the characters involved! I felt like both story arcs were balanced and well done, though I especially loved the action and twists near the end for the historical one. I also liked that the romanc Jaime Jo Wright did it again! I loved this one just as much as I did her debut, "The House at Foster Hill." Of course it doesn't hurt that the cover is so dreamy and perfect, but the story inside is the real winner. Gripping and mysterious and making me hang on with my fingernails and feel great fear for the characters involved! This novel pulled me in quickly! While both the current day and early 1900s story lines held my interest, it was the current day story of Annalise that I enjoyed more. The story from the 1900s was incredibly twisted and I was shocked to learn it was partially based upon actual events. The love square from the early 1900s fell flat for me, but other than that I found The Reckoning at Gossamer Pond to be a solid mystery novel. If you enjoy a good mystery and time-slip novels, check this one out ! Rounding up to 4.5 stars. This was another great story with mystery until the very end. Just when I thought I had it figured out, nope got that one wrong too. I obviously would not make a very good detective. This is a time-slip story of Annalise Forsythe and Libby Sheffield. Both residents of Gossamer Grove, Wisconsin, one in 1907, the other in present day -- but the question is, how are they connected. With Annalise in present day running a coffee shop, wanting to open a food pantry for the und Rounding up to 4.5 stars. This was another great story with mystery until the very end. Just when I thought I had it figured out, nope got that one wrong too. I obviously would not make a very good detective. This is a time-slip story of Annalise Forsythe and Libby Sheffield. Both residents of Gossamer Grove, Wisconsin, one in 1907, the other in present day -- but the question is, how are they connected. With Annalise in present day running a coffee shop, wanting to open a food pantry for the under privileged, and hiding a secret even she won't tell. When Eugene Hayes dies and leave her everything, including all the pictures of her inside his trailer, and her boyfriend from high school, Garrett Greenwood, comes back to town, does the real mystery start and what is her connection to them. Libby Sheffield is the daughter of a newspaper man, who also holds a secret so dark only three people know, and receives mysterious obituaries before people die. She is friends with preacher son, Calvin, but it is Elijah Greenwood that is always there for her. When the revival comes to town, Jacobus Corbin, comes to town he brings feelings to Libby even she cannot fight. Jaime Jo Wright's debut novel captivated me and I knew that she was an author to follow. Her sophomore novel only deepened that resolve. Gossamer Grove is a town of Midwestern charm and home town values. However, Annalise Forsythe has painful secrets and knows more and they all hover over the pleasant façade the town displays. She is suddenly bequeathed a run down trailer and discovers it is full of obituaries, and photos of her! There are indeed some dark secrets in this town. Over a century ear Jaime Jo Wright's debut novel captivated me and I knew that she was an author to follow. Her sophomore novel only deepened that resolve. Over a century earlier, Gossamer Grove is stirred to repentance by the arrival of two twin revivalists, come to town to bring God to the midst of these people. They instead create chaos and people begin receiving their obituaries before they're even dead. Libby Sheffield, the newspaper owner's daughter, receives those obituaries at the paper. She begins to try to solve these crimes, then realizes she herself is in great danger. Wright once again writes in a dual timeline, switching effortlessly between the two, captivating her readers with this mystery that has been going on for over a century. One mystery is wrapped up in another and the two blend in a completely spellbinding way. Both women, a century apart, work to solve this mystery before more lives are taken and maybe even souls ruined. I was completely caught up in this and could not wait to find out what the end result would be. I was totally surprised, too. Highly recommended. I find myself longing for Wright's next novel. Wright has truly hit her stride in this second standalone novel filled with edge-of-the-seat suspense. She expertly weaves two timelines together and brings to life a small town filled with secrets. I enjoy the unique writing style and look forward to Wright's next book! I wasn’t sure what to expect from The Reckoning of Gossamer Pond except for suspense and faith. I admit, I figured it would be a little on the creepy side because of Ms. Wright’s first novel, The House on Foster Hill. While Ms. Wright does give the reader suspense and faith, the mystery aspect is so much more. From the opening line, I was pulled in. Where the deaths in 1907 Gos I wasn’t sure what to expect from The Reckoning of Gossamer Pond except for suspense and faith. I admit, I figured it would be a little on the creepy side because of Ms. Wright’s first novel, The House on Foster Hill. While Ms. Wright does give the reader suspense and faith, the mystery aspect is so much more. From the opening line, I was pulled in. Where the deaths in 1907 Gossamer Grove, Wisconsin merely accidental? Was there something sinister in happen? And when it becomes obvious that the deaths have some link, who is to be blamed? I loved the mystery in the 1907 thread and present day Gossamer Grove. I wanted to know how the two stories connected and I hoped that there would be some romance woven in the two. There is so much spiritual truth in this novel that you’ll want to soak up and enjoy. Ms. Wright did a great job on her second novel and has made me a fan. I eagerly await the publication of The Curse of Misty Wayfair (not to mention the cover is phenomenal). Another great mystery by Jaime Jo Wright! This one kept me guessing all the way to the end. I absolutely loved Jaime Jo Wright's debut and looked forward to her second novel with high expectations. Though the mysteries were intriguing and kept me reading, it was a bit slower than her debut and a tiny bit less suspenseful. However, even though I didn't love it as much as her first, it was still a solid suspense/mystery which kept me guessing right till the end. There was a few things I guessed right, especially in the present day mystery, whereas the historical mystery kept me confused I absolutely loved Jaime Jo Wright's debut and looked forward to her second novel with high expectations. Though the mysteries were intriguing and kept me reading, it was a bit slower than her debut and a tiny bit less suspenseful. However, even though I didn't love it as much as her first, it was still a solid suspense/mystery which kept me guessing right till the end. There was a few things I guessed right, especially in the present day mystery, whereas the historical mystery kept me confused a lot more. I adored both the historical and present day characters, though I think I connected a bit more with Annalise and Garrett (present day), though the secret Libby hid was a lot more traumatic. I secretly adored the ending for Libby (sort of hoped that it would lead that way). The theme of forgiveness and grace came across strong in both story lines and I hope we will all strive to be people who will grant forgiveness and make it possible/easy for others to share their struggles with us. “God can do pretty stellar things with screwed-up people”. Suspicious deaths with over a hundred years apart. Is it a coincidence or is there more going on in Gossamer Grove than the eye can see? This is the second book I have read by Jamie Jo Wright. Just like her debut novel she nailed the suspense element. I liked that I was guessing until the last chapter. My heart broke for all of the main characters they all experienced some heart wrenching challenges. But I enjoyed each of their journey t “God can do pretty stellar things with screwed-up people”. My heart broke for all of the main characters they all experienced some heart wrenching challenges. But I enjoyed each of their journey to healing, freedom and restoration. I like that some of the characters did not end up where I thought they would. Grace is the main theme that is explored in these stories. I like that different facets of Grace is expressed through each of the characters individual story. I also listened to the accompanied audio book read by Erin Bennett. I give her 4.5 Stars for her excellent performance. Melodrama overload for me. I wasn’t really in the mood for that, nor was I prepared for the expletives and profane phrases that popped up on occasion throughout this book (more frequently than in this author’s previous book). That latter point was a huge turn-off for me. The mysteries kept me interested enough to come back to this book after setting down the nonfiction book I was working on. I also found the obituary angle quite unique and intriguing. Content: expletives, profane phrases, marital Melodrama overload for me. I wasn’t really in the mood for that, nor was I prepared for the expletives and profane phrases that popped up on occasion throughout this book (more frequently than in this author’s previous book). That latter point was a huge turn-off for me. Terrific read of us as sinners and God as the great giver of grace and forgiveness. "Didn't you know? Didn't you read? Tonight is your time to die." Deep, dank, dark secrets. The town of Gossamer Grove has been drowning in them for well over a century; curious notes bearing sad tidings for their recipients, confirming that "the boundaries which divide Life from Death are at best shadowy and vague". It all began when Libby Sheffield found Deacon Greenwood hanging from the rafters of his carriage house at the break of dawn. Traumatized and confused when two totally different obitu "Didn't you know? Didn't you read? Tonight is your time to die." It all began when Libby Sheffield found Deacon Greenwood hanging from the rafters of his carriage house at the break of dawn. Traumatized and confused when two totally different obituaries are submitted, Libby and her friend Elijah decide that the truth isn't worth pursuing, but a second death follows the first. It seems that someone in Gossamer Grove has taken the words "vengeance is mine" completely out of context; while twin revivalists stir revolt among the souls of many. Some would say that the two are related, while Libby finds herself caught in the middle. Years later Annalise Forsythe is forced to remove the scabs of her own wounds when the untimely death of the local town hermit brings her painful past back to life. His entire trailer is not only filled with historical memorabilia; Annalise's life is shockingly pasted all over the walls. What possible connection could she have to Eugene Hayes? And why is someone upset enough about it to threaten her safety? Two women, separated by decades, sharing common regrets, desperately seeking freedom, learning that "life is hard and it take guts, faith, and a massive amount of out-of-this-world grace" to move forward. "For the wages of sin is death, . . . . . but the gift of God . . . . is eternal life . . . . " And that's no secret. Who wouldn't love a story like this one? The Reckoning at Gossamer Pond is a fabulous book! I enjoyed getting to know the people of Gossamer Grove, especially Annalise and Libby. I am a huge fan of time slip novels and this one did not disappoint. It is full of secrets, mystery and suspense. Which kept me intrigued and fascinated until the end. I just could not put it down. I highly recommend The Reckoning at Gossamer Pond and give it a well deserved 5 plus stars. I received this book from the author, but was not required to write a re The Reckoning at Gossamer Pond is a fabulous book! I enjoyed getting to know the people of Gossamer Grove, especially Annalise and Libby. I am a huge fan of time slip novels and this one did not disappoint. It is full of secrets, mystery and suspense. Which kept me intrigued and fascinated until the end. I just could not put it down. Author, Jaime Jo Wright, delivers another haunting split time mystery that'll have you cautiously but irresistibly turning pages late into night. I was drawn in from the very first page. Ms. Wright seduces the senses with her haunting imagery of Gossamer Pond and its residents. Separated by a century the strong cast of characters add dimension to an already twisting plot and will leave you as anxious to solve the mystery as Libby and Annalise are. Ms. Wright magnifies the historic element by wea Author, Jaime Jo Wright, delivers another haunting split time mystery that'll have you cautiously but irresistibly turning pages late into night. I was drawn in from the very first page. Ms. Wright seduces the senses with her haunting imagery of Gossamer Pond and its residents. Separated by a century the strong cast of characters add dimension to an already twisting plot and will leave you as anxious to solve the mystery as Libby and Annalise are. Ms. Wright magnifies the historic element by weaving together the intricate threads of faith, forgiveness, and grace. The highlight of this story are the eerie obituaries penned in the gothic style reminiscent of Edgar Allan Poe that'll send a shiver of chills down your spine. I highly recommend for those who enjoy a good mystery, peculiar characters, and don't mind sleeping with the light on at night. Wow...this is another how-do-I-find-the-words-to-explain-how-I-feel kind of books. Definitely masterfully written. The way Wright weaves together past and present...the pacing of information revealed, the mystery build up -- it's incredibly well done. Kept me hanging every time we flipped from 1907 to present day. And the author is infuriatingly (and delightfully) slow at revealing all the pieces of the puzzle. I went from lost, to grasping at hints of clues to formulating a hypothesis only to have it dashed and scrambling to start all over again. At first, the stories seem so separate and unconnected in any deep way but that gradually changes with every new revelation until they converge on each other in a frantic rush of action and danger in the nail-biting conclusion. Phew! I was riveted. And a little swoony over the Gothic elements that created all that moody ambiance! Jaime Jo Wright is a gifted wordsmith and I kept pen and paper on hand to copy down bits of exquisite perfection that I didn't want to forget. Lots had to do with the exceptional inspirational threads on forgiveness and grace woven into both time periods....mind boggling doesn't begin to cover it. Maybe the most compelling and moving I've ever read in a novel. She doesn't shy away from awkward questions and hard realities. And she writes in a way that urges the reader to dig deep and come to their own reckoning. What more can I say? Two incredible heroines, a complicated mystery that spans a century and the kind of delicious writing that begs to be read out loud...with frequent pauses so you can sit in the moment and absorb it all. Sublime! I'm just going to quit reading these time-slip novels. Too hard to follow. I don't like a book I have to work at keeping the characters and timelines straight. Too many other good books to read. Jaime Jo Wright not only transports you to historic Gossamer Grove, but present day Gossamer Grove in a way that you never want to leave. Her ability to pull you into not one time period, but two, is uncanny. The stories might be decades apart, but they flow perfectly together, and collide in a way that surprises you. I thought I had this story pegged after the first few chapters. I knew the "whodunnit", how the characters were all going to come together, and what was going to happen in the end. Jaime Jo Wright not only transports you to historic Gossamer Grove, but present day Gossamer Grove in a way that you never want to leave. Her ability to pull you into not one time period, but two, is uncanny. The stories might be decades apart, but they flow perfectly together, and collide in a way that surprises you. I thought I had this story pegged after the first few chapters. I knew the "whodunnit", how the characters were all going to come together, and what was going to happen in the end. Or so I thought - I was wrong. I may have had a few high points, but that's about it. Wright has a way of leading you down a path of thoughts, only to branch off the road a little bit and jumble your thoughts. She may come back to the same path, or branch off even more. This is the great thing about her story - you are left with surprises, excitement, mystery, and the unknown until the very end. Historic Gossamer Grove really grabbed my attention. The Corbin brothers in particular really struck me. They were very dynamic in how they presented their message. I could only imagine if that was how they presented the message today, what would happen to them. But even so they spoke truths that we all need to hear about our own sinful lives. Reading their scenes really makes you ponder how your own life is being lived. Now, I'm not saying that we all need to get out there and yell our sins to the world, however maybe we just need to stop and look into the mirror and reflect on how we can move past those sins that have us stuck in a rut. There are other moments and characters that brought this to my attention as well, and I have to say it moved me in a way I was not at all expecting. It blows my mind that this is only Wright's second novel. She has such an artistic writing style that makes me feel as if I have been reading her books for years. It's like grabbing that comforting blanket that you'll never get rid of, or talking with your best friend since kindergarten. You love it, always want it/her around you, and never want to let it go. I cannot wait to see what she comes up with next. This is an author to keep an eye on, and if you haven't read her novels, I highly suggest you do so now. She easily has made her way to my favorites list, and I can see her remaining there for years to come. Readers who enjoyed Jaime Jo Wright's debut novel, "The House on Foster Hill", will be pleased to learn that her sophomore offering is every bit as good as her first! The novel zings along with well-plotted transitions between past and present, engaging readers thoroughly into the mysterious events tying together the residents of Gossamer Grove from the early 1900s to our modern times. I would be hard pressed to say which character I enjoyed reading about more, whether the historical Libby or th Readers who enjoyed Jaime Jo Wright's debut novel, "The House on Foster Hill", will be pleased to learn that her sophomore offering is every bit as good as her first! The novel zings along with well-plotted transitions between past and present, engaging readers thoroughly into the mysterious events tying together the residents of Gossamer Grove from the early 1900s to our modern times. I would be hard pressed to say which character I enjoyed reading about more, whether the historical Libby or the modern Annalise, as both are unique and special in their own right. The host of secondary characters are equally well-developed, and I appreciated that the romance was handled with a deft hand that fit well into the story. 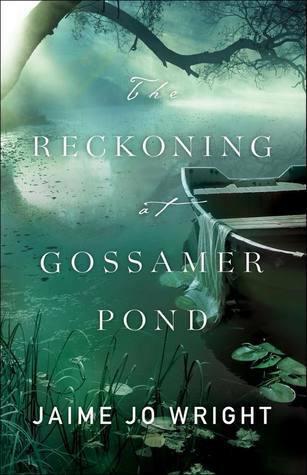 "The Reckoning at Gossamer Pond" will immerse you in its secrets and suspense, drawing you ever deeper into the story as you consider who is behind the past murders and also the danger stalking Annalise. I can attest that there are plenty of unexpected moments that will have you questioning where you thought the story was going! I enjoyed encountering the historical elements that the author explores, such as the tent revival meetings and the fiery evangelists that host them, seeing how such events can have an important long-term impact on a town and its residents. And in the midst of mystery, a theme of undeserved, rich grace threads itself into the happenings of these characters' lives, adding a richness to the story that deeply satisfies. If you are anything like me, you will close the pages of this story feeling both entertained and appreciating anew the amazing God who loves us. Jaime Jo Wright has written another solid novel, and will no doubt leave her readers looking forward to what is next to emerge from her talented pen. I award this book a solid 4 out of 5 stars, and encourage you to immerse yourself into this intriguing tale. 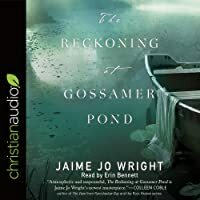 The Reckoning At Gossamer Pond by Jaime Jo Wright is a gripping contemporary and historical Christian suspense which I loved. The dual timelines of present day and 1907 have parallel stories that link across the years. Both have characters drowning in guilt and unforgiveness as secrets threaten to overwhelm. "It is a horrible place to wallow when you cannot forgive yourself." We punish ourselves and forget all about grace. "Without... grace, it was hard to crawl out of that pit." God's grace cove The Reckoning At Gossamer Pond by Jaime Jo Wright is a gripping contemporary and historical Christian suspense which I loved. The dual timelines of present day and 1907 have parallel stories that link across the years. Both have characters drowning in guilt and unforgiveness as secrets threaten to overwhelm. "It is a horrible place to wallow when you cannot forgive yourself." We punish ourselves and forget all about grace. "Without... grace, it was hard to crawl out of that pit." God's grace covers all our sins. "Grace is receiving what we do not deserve." God's grace is available for all who truly believe. Faith in God must be genuine and from the heart. Faith is not just for Sundays and giving the appearance of faithful. Faith is to be lived out every day. God sees our hearts. We must not judge others and find them lacking. Any judging and convicting is God's job. Ours is to love as He loves us. Within the novel the revival of 1907 has its roots in fact. Fiery preachers contrast with those who lovingly correct. Love and loyalty are present in the novel. There is a beautiful friendship in 1907. The sins of the parents do not revisit the children. Children are a gift from God, no matter how they are conceived. Another fabulous story from Jaime Jo Wright that has murders and mysteries down the ages to solve. I was totally gripped and guessing throughout. I wasn’t really interested in the story so i DNFed. Jaime Jo Wright is making a name for herself in time-slip mysteries. I really enjoy historical mysteries, but for years, I have had a hard time finding an author who would do it justice. Wright has stepped up the genre game and has impressed me with her stories. I thoroughly enjoyed The House on Foster Hill, so I couldn't wait to get a copy of The Reckoning at Gossamer Pond. Gossamer Pond was much more exciting than Foster Hill. Wright did an awesome job writing this time-slip mystery. Her writi Jaime Jo Wright is making a name for herself in time-slip mysteries. I really enjoy historical mysteries, but for years, I have had a hard time finding an author who would do it justice. Wright has stepped up the genre game and has impressed me with her stories. I thoroughly enjoyed The House on Foster Hill, so I couldn't wait to get a copy of The Reckoning at Gossamer Pond. Gossamer Pond was much more exciting than Foster Hill. Wright did an awesome job writing this time-slip mystery. Her writing is clear and concise. I had no problem visualizing the small town of Gossamer Pond. From the quirky characters to the historical buildings and town. I loved traveling through the town in present day with Annalise and Garrett and traveling with Libby in the past. The mystery was deeply woven together from the past to the present. I don't know how Wright kept track of who showed what before the other story learned it, but she does a wonderful job at weaving two timelines together. As for the mystery, I really enjoyed it. I had some suspicions on who did the killing, but Wright pulled someone out that I really didn't see doing it. I flipped back through the story to see if I could follow the trail of clues. The past one I found the trail, but the present one, I didn't find any clues to signify that person. Oh, well. Maybe need to study more. Overall, the mystery kept my attention, and I couldn't read the story fast enough. I wanted to spend more time reading, but life gets in the way. As for the romance, I really didn't feel anything toward one set of characters over another. They were both interesting and had past elements they needed to reconcile and move forward with. I didn't see the past relationship coming at all. But I'm glad the present relationship moved forward with the hurts from the past. The spiritual element of redeeming the past rang pretty strong and clear in this novel. Wright doesn't shove it down my throat, instead, she wraps it in a wonderful tale. In conclusion, The Reckoning at Gossamer Pond is a captivating tale of mystery filled with a plot of quirky characters who make the story what it is. I spent a lot of time investing in reading this story, and I thoroughly loved it. I really can't wait to read Wright's next book. Fans of Johanna Davidson Politano and Wright's first book would love this book. Do you have a secret? Something that haunts you and torments you with memories? Jaime Jo Wright is back with her witty writing dealing with the deep hidden side of our souls, the part weighted down by burdens we can't change. Gossamer Grove is not your quaint charming small-town. A fault-finding newspaper, a quintessential founding family, and cryptic obituaries. Add to that two seemingly censorious brothers speaking promises of revi Do you have a secret? Something that haunts you and torments you with memories? Jaime Jo Wright is back with her witty writing dealing with the deep hidden side of our souls, the part weighted down by burdens we can't change. Gossamer Grove is not your quaint charming small-town. A fault-finding newspaper, a quintessential founding family, and cryptic obituaries. Add to that two seemingly censorious brothers speaking promises of revival and there's enough to start an uproar or keep people fearfully quiet to their own preoccupation. Still, there might be a few who might question if light can shine, and dare they say actually hope for it. Grace and forgiveness are not unknown concepts, but when do they go beyond an idea to a conviction? Two women centuries apart but connected by the same weight of sin, will they be able to be who the town and their close ones, not to mention their own safety, needs them to be - shrewd characters able to see the river of life within not just the superficial carefully crafted story. Once again, well done Jaime Jo Wright for writing a thrilling, powerful and thoughtful story. I found this title to be a bit slow and a bit dull. True it was a dual-time novel and typically these are my favorite, but this one just did not engage me. Reading this book was like watching paint dry. It was slow and rehashed the same topics and dialogue again and again. Weak female characters, one dimensional characters, stilted language, and a thin mystery were all frustrating. The frosting on the cake was the prosthelytizing the author does - in heavy doses. The time-slip format worked really well in this novel, allowing the reader to observe the historical events as they played out at the same time as the contemporary characters are trying to discover what really happened. And yet the plot kept me guessing on both counts! The historical story was particularly intriguing thanks to the twin revivalists, Jedediah and Jacobus Corbin—who, I might add, were based on actual historical persons. If you’re one of those people who doesn’t bother with the author’s notes at the end of the book, make an exception for this one. Truth really does make the best fiction at times! But I was equally invested in the contemporary story, thanks in no small part to the presence of Garrett Greenwood and the personal history between him and Annalise. However, one of the things I loved most about this novel was that sin was a character in its own right. Hidden sins, weaknesses, and brokenness—these were the true spectres that haunted Gossamer Grove and needed to be brought into the light of day, even after the human villains were discovered. And a final word on the romance: subtle, but very well suited to the characters and the tone of the story. Can’t wait for the next book from this author! What can I say? I am in love with Wright's writing! She knows how to pull you so completely into a story, that you feel like you're trying to wrangle a whirl-wind, whew!! She'll flip you every which way but up and make you lose your breath from the start. Seriously, I didn't breathe until the very last page and by that time, I was hyperventilating! Wow! This mystery filled with long hidden secrets and unexplained deaths will captivate its readers from the beginning. Ms. Wright has proven that she is not just a one-and-done writer. The Reckoning at Gossamer Pond has placed her on the top of my list. She writes time-slip novels with the skill of an expert, connecting a modern-day mystery to one in the past. She has a knack to keep me equally involved in both Annalise and Libby's stories. The two stories were deftly woven together, leaving t Wow! This mystery filled with long hidden secrets and unexplained deaths will captivate its readers from the beginning. Ms. Wright has proven that she is not just a one-and-done writer. The Reckoning at Gossamer Pond has placed her on the top of my list. She writes time-slip novels with the skill of an expert, connecting a modern-day mystery to one in the past. She has a knack to keep me equally involved in both Annalise and Libby's stories. The two stories were deftly woven together, leaving the reader guessing at the common link until the very end. The suspense builds equally as each story unfolds. I found the mystery surrounding the murders during a small-town revival to be unique, filled with an original, quirky and broken cast of characters. There is an underlying theme of grace and forgiveness for the broken that spoke to me. It is not preachy, but flows seamlessly throughout the story. Fans of historical fiction and mysteries will not be disappointed. Wright has raised the bar for all who follow her in this genre. I voluntarily reviewed a complimentary copy of this book from the author/publisher. I was not required to write a review. All opinions expressed are my own. This story exceeded my expectations. The depth of the characters, the exceptional descriptions of location and word imagery that go beyond your typical fiction novel. The very atmosphere of the story is vivid and realistic. I didn’t just read this story, I lived the story! I walked the streets of Gossamer Grove, I took a seat on a stale staw bale of hay that stuck the back of my legs. I felt hurt and sadness at the painful secret that Annalise has had to live with. I turned on lights and nearly reached for my pepper spray at one point. I found myself looking over my shoulder and gasping in shock as the truth was revealed. Jaime Jo Write has expertly woven together two time periods, each filled with dynamic characters and circumstances. The author doesn’t shy away from the difficult topics. Within the pages, you’ll be challenged to take a hard look at sin, judgment, forgiveness and extending grace. I didn’t want to put this book down for a moment, I was captivated! I’m typically not a huge fan of suspense, I’ll occasionally pick up one to read. However, I’m coming to the conclusion that if it’s by this author, I’ll want to pick it up every time! Trust me when I say that you won’t want to pass up the opportunity to read this outstanding new book! I give it 5++ stars and encourage you to snag a copy for yourself!